Issue: Are Labels Good for Kids? Gathogo M. Mukuria and Jeffrey P. Bakken remind us that the benefits of labeling—educational, research, and monetary funding—far outweigh the negative effects. Furthermore, labeling is required by federal law. The authors urge us to use labels responsibly and for the benefit of the individual’s education. Scott M. Shannon, psychiatrist and former president of the American Holistic Medical Association, explains why he believes it is advantageous to look for ways to relieve stressors in a child’s environment rather than seek a label, which might do more harm than good. Issue: Is the Inclusive Classroom Model Workable? Xuan Bui, Carol Quirk, Selene Almazan, and Michele Valenti present evidence from more than 20 years of research to remind us that the inclusion of students with disabilities in general education classrooms results in positive outcomes for both students with high-incidence disabilities (e.g., learning disabilities) and low-incidence disabilities (e.g., intellectual, multiple). Karen Ball from Shelby County Schools in Tennessee, a former special education teacher and school administrator, and Reginald Leon Green, a professor of educational leadership at the University of Memphis, examined the attitudes and perceptions of school leaders in the southeastern United States regarding inclusion. Their survey results revealed school leaders are limited in their training and experience relative to special education and inclusive practices, which may lead to negative attitudes toward the inclusion of students, particularly those with severe disabilities, in the general education setting. Issue: Is Disproportionally High Minority Representation in Special Education a School Problem? Edward Fergus is deputy director of the Metropolitan Center for Urban Education at New York University. Previously a high school teacher, Dr. Fergus consults on issues of disproportionality. His study of over 30 districts identified common root causes of disproportionality and remedies for each one. Richard Rothstein, a research associate of the Economic Policy Institute, writes and speaks on issues of education, economics, and policy, with a focus on the achievement gap. Mr. Rothstein posits that schools alone cannot overcome the effects of poverty on a child’s life and education. Issue: Can RTI and IDEA Child Find Coexist? Lynn S. Fuchs, a prolific scholar in the area of learning disabilities and one of the several researchers in the National Research Center for Learning Disabilities, explains how Research to Intervention (RTI) strategies can separate a struggling learner from one with specific learning disabilities (SLDs). Research results demonstrate her thinking. Jose L. Martin, partner in the law firm Richards Lindsay & Martin in Austin, Texas, represents schools in disability issues and litigation, sees promise in RTI, and also discord with IDEA that could cause tension and conflict between schools and parents. Perhaps revision of the 35-year-old IDEA is in order to recognize changes in general education. Issue: Can Whole-School Reform Reduce Discipline Problems? Howard S. Adelman and Linda Taylor, co-directors of the UCLA School Mental Health Project, based in the Center for Mental Health in Schools, believe that many discipline problems could be eliminated by whole-school initiatives that create and sustain an environment that addresses positive social and emotional development as well as academics. William C. Frick and Susan C. Faircloth, assistant professors at the University of Oklahoma and the Pennsylvania State University, respectively, present dilemmas faced by principals torn between balancing the needs of one particular student who exhibits disruptive behavior with those of the rest of the student body, whose learning is affected by the single student’s actions. Issue: Should Insurance Cover Treatments/Services for Autism? Autism Speaks, an advocacy organization founded by Suzanne and Bob Wright (former executives of General Electric and NBC and NBC, respectively), together with the National Alliance for Autism Research and Cure Autism Now, presents eight arguments in support of legislation mandating health insurance coverage of autism services. Writing for the Council for Affordable Health Insurance, an organization that promotes the affordable health care access for all Americans, Victoria C. Bunce and J.P. Wieske discuss national trends in state-mandated health care benefits for children with autism, arguing that responsibility for these costs belongs elsewhere. Issue: Should RTI Interventions Be Delivered by Special Educators? Douglas Fuchs, Lynn S. Fuchs, and Donald L. Compton, professors at Vanderbilt University, and prolific scholars whose extensive research is in the area of student instruction and assessment, propose that the Smart RTI of the future taps the unique pedagogical training of special educators to implement Tier 3 interventions. Linda P. Blanton, Marleen C. Pugach, and Lani Florian, professors at Florida International University, the University of Wisconsin-Madison, and the University of Aberdeen, Scotland, respectively, blend the perspectives of two well-respected professional organizations to envision the future of RTI in the hands of general education teachers trained to teach all children who enter their classroom. Issue: Should Special Education Be Redefined and Redesigned? Mara Sapon-Shevin, professor of inclusive education at Syracuse University, New York, urges educators to redefine and redesign the inclusive classroom so inclusion can incorporate the principles of diversity, access, differentiation, and positive behavior management. When classrooms are truly inclusive, students are comfortable with differences, learn the skills necessary to confront challenging issues, and are aware of their interconnectedness. Patrick A. Schwarz, associate professor at National-Louis University, Chicago, feels students should never have to earn their placement in a general education classroom semicolon; rather all students should be supported in the general education classroom, even those with significant behavioral challenges. Key to this placement is not redefining or redesigning special education but having an inclusive education model that has the following components: neighborhood schools, general education homeroom, no segregated spaces, continual planning, teaching based on best practice, a problem-solving mindset, and access to after-school activities and social relationships. 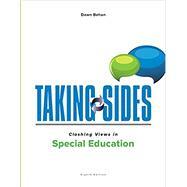 Issue: Should Special Education Be Aligned to Common Core State Standards? Raymond J. McNulty and Lawrence C. Gloeckler present the case that Common Core State Standards (CCSS) are what all students should be expected to know and be able to do for success in college and in their careers. To that extent, students with disabilities should be provided with instructional strategies based on the principles of the Universal Design for Learning, and assistive technology devices and services to enable access to the standards. Jane Best and Courtney Cohen note that individualized education programs (IEPs) must be meaningful to the student but still focus on CCSS. However, teachers who work with students with disabilities often report the academic goals outlined by the CCSS cannot be adequately or appropriately incorporated into an IEP. Best and Cohen recommend the translation of academic skills addressed in CCSS with life skills or students with disabilities. Issue: Are Public Schools Providing Adequate Transition Services and Programs for Students with Disabilities? Russell G. Dubberly found that a dynamic instructional model can increase positive transition outcomes for high school students with disabilities. This model facilitated the use of self-determination training, functional academics, positive behavioral strategies, and normalization theory to promote community access and employment and increased social opportunities. He concluded that a team of educators can work collaboratively toward the common goal of students successfully transitioning from high school to adult living. James T. Herbert, Dawn C. Lorenz, and Jerry Trusty, all from the Pennsylvania State University, examined career service practices of high school youth with disabilities. Survey results revealed most services have a positive impact on career development, but career services occur later rather than earlier in high school, collaboration among team members varied as well as the understanding of career service needs, and the usefulness of transition needed for high school students with disabilities varied between transition personnel. Issue: Do Gifted and Talented Students Need Special Schools? Chester E. Finn, Jr., senior fellow at Stanford’s Hoover Institution, believes our most talented and gifted students continue to be left behind when we focus on universally educating all children to reach a minimal level of academic achievement. He proposes more gifted and talented programs and classrooms in elementary schools and more Advanced Placement courses and specialized schools during secondary education to remedy this issue. Susan Winebrenner and Dina Brulles work with educators to design and deliver cluster-based programs that address the needs of the gifted within their neighborhood school and provide options for a range of students to reach their potential. Issue: Is Mental Health Screening an Unwarranted Intrusion? Nathaniel Lehrman, clinical director (retired) of the Kingsboro Psychiatric Center, New York, warns that new mental health screening requirements, heralded as a way to increase the health of the nation, will intrude on basic freedoms, lead to inappropriate labels, and increase revenue for pharmaceutical companies. Kenneth E. Warner, Thomas F. Boat, and Mary Ellen O’Connell present a case for the prevention of mental illness through screening that includes the identification of risk factors in three areas: the community, group exposures, and individual behaviors. Identification of these risks through mental health screening may lead to needed resources to reduce these risks. Issue: Should the Government Prohibit the Use of Restraint and Seclusion in Schools? The National Disability Rights Network (NDRN) has authored three major reports highlighting concerns about the use of restraint and seclusion in schools. In the face of continuing legislative gridlock, the latest report urges the U.S. federal Department of Education to issue clear guidance limiting restraint and seclusion to situations posing an imminent danger. Sasha Pudelski, government affairs manager for the American Association of School Administrators (AASA), presents her organization’s position that restraint and seclusion need to be available tools in schools. Banning their use with any and all students could actually increase the potential for injury. Issue: Is ADHD a Real Disorder? Evelyn B. Kelly, a science writer, journalist, and adjunct professor at the College of Education, St. Leo University, presents an encyclopedia of characteristics, causes, and interventions for the several conditions, which are all very real attention deficit hyperactivity disorders. Melanie Price and Diana Raffelsbauer write that ADHD remains a controversial issue in the scientific and medical communities due to several factors, including that there is no single cause of ADHD, identified risk factors are nonspecific, there is a lack of common susceptibility genes/loci, and there are difficulties in making a clear-cut diagnosis. These factors have led to the conclusion that ADHD was invented and not discovered. Issue: Are Evidence-Based Practices Sufficient for Educating Students with Autism? Vito Loiacono, Long Island University, and Valerie Valenti, Eastern Suffolk BOCES, believe all teachers need to be prepared to teach all children, including those with autism, in inclusive settings. Sufficiently educating students with autism must involve evidence-based practices, including Applied Behavior Analysis (ABA) methodologies and interventions, which help not only children with autism but also children with other disabilities. Ken Siri and Tony Lyons are fathers of children on the autism spectrum. They view children with autism as individuals whose bodies have fallen victim to a perfect storm of problems. They introduce an edited book of “cutting-edge therapies,” designed to inform readers of possible treatments, many of which have not been vetted by research. Issue: Working with Parents of Students with Disabilities: Does It Have to Be Contentious? Adrian Woo Jung, an associate professor in the Department of Special Education at California State University, Fullerton, examines the barriers that may adversely affect the level of participation of parents who are culturally and linguistically diverse (CLD), among them being the gap that exists between the attitudes or perceptions of professional educators and the perspectives of CLD parents regarding the needs of their children with disabilities. Jennifer Krumins, a special education teacher and mother of a child with autism, advises parents to ease tension, stress, and pressure by finding an advocate who can serve as an “interpreter” in a complex educational system and teach them how to secure the necessary supports with a positive approach. Issue: Are All Teachers Effectively Prepared to Teach in Inclusive Settings? Bethany M. Hamilton-Jones, University of Rhode Island, and Cynthia O. Vail, University of Georgia, found that pre-service teachers in the United States believe collaboration between educators is a vital skill for teaching all students—those with and without disabilities—in inclusive settings. Although the preservice teachers felt they had been adequately prepared to collaborate with others in the classroom setting, some of them, while in their student teaching experiences, did not observe in-service teachers modeling collaboration and could note why collaboration was vital to co-teaching in the inclusive classroom. Jewell E. Cooper, Stephanie Kurtts, Ceola Ross Baber, and Ada Vallecorsa, all faculty in the Department of Specialized Educational Studies at the University of North Caroline at Greensboro, examined the knowledge, skills, and competencies necessary for general education teacher to teach students with disabilities in inclusive classrooms. After surveying faculty in the School of Education, findings showed a disconnect between preparing elementary educators and special educators; upon further analysis, this same disconnect was found in the preparation of middle and secondary educators vs. special educators. A key finding was the need for teacher preparation programs to prepare both general and special educations teachers to be effective teachers in inclusive classrooms. Issue: Are Alternate Assessments Adequate or Necessary? Martha L. Thurlow, Rachel F. Quenemoen, and Debra Albus, from the National Center on Educational Outcomes at the University of Minnesota, stress that an important role for school leaders is to assure educators as to the purpose of assessment, no matter if they are general or alternate, and determine what students have already learned and what needs to be the focus of future instruction. Debra Bruster uncovers research about teachers’ perceptions of alternate assessments. This research shows teachers believe alternate assessments evaluate the ability of students with disabilities to complete a task, but they do not evaluate students’ learning and knowledge.